Witches were accused of tossing raccoon parts on the doorsteps of businesses, as part of a Wiccan community feud. Sharon Graham, 46, and a fellow Wiccan, Frederick Purtz, 22, pleaded not guilty Wednesday to charges of littering and malicious destruction of property. Graham also was charged with intimidating a witness. They were accused of putting a raccoon head and entrails on the doorsteps of Angelica of the Angels and the Goddess' Treasure Chest in May. 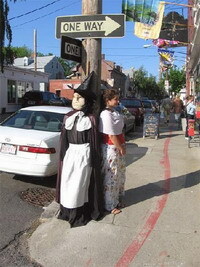 The historic seaport, famous for holding witch trials in the 17th century, has an active Wiccan community and thriving witch-related tourism. David Gavegnano, a lawyer for Graham, and Sean Wynne, a lawyer for Purtz, both denied that their clients had anything to do with the incident. They also argued that at any rate, the malicious destruction charge was not valid because the storefronts were not permanently damaged. A witness, Richard Watson, told police he accompanied Graham, Purtz and other people when they put the raccoon remains on the doorsteps. He said Graham hoped to frame a Wiccan businessman who had fired Graham from a psychic telephone business last spring. Watson also said Graham had a disagreement with the owners of the two targeted businesses over proposed regulations that would limit the number of psychics who come to the city during the Halloween season. He said he was told the group had found the raccoon dead. Gavegnano declined to comment on Watson's accusations Thursday. Wynne told The Boston Herald said there were likely "internal issues within the Wiccan community," but the tossing of raccoon entrails may be a "bastardization" of Wiccan practice because the religion does not condone harming others.